The KRUPS GPA30842 Immersion Blender is a German engineered appliance that is designed not only for high-performance and quality, but also durability. This blender features six variable speeds and an LCD display to easily choose the right speed. It also features a comfortable, ergonomically designed, soft grip handle. The stainless steel shaft is removable for easy cleanup and storage. This unit also comes with a measuring beaker, mini chopper, a whisk and a wall mount. When researching the KRUPS GPA30842 Immersion Blender we were only able to find a little over a dozen reviews online, but the good news is that the reviews are very positive. This blender received a 4.4 star average user rating out of a possible 5 stars. The reason the majority of the reviews for the KRUPS GPA30842 are positive is because this blender has a lot of great qualities. It is simple to use, easy to wash, it is very robust, and it is also inexpensive. It is a very durable appliance that is built to last. One customer said that they have been using this blender every day for a year and it is still like new. They also said that it is lightweight and easy to handle. A lot of the reviews are saying that this blender is durable but there was one customer that said one of the propeller blades broke off. However, this person also said that the blender still worked great and one of the propeller blades missing didn’t affect the performance of the appliance at all. They also said that Krups America is sending them a replacement blade shaft for free. It’s nice to know that a company stands behind their product and that you can have your problems taken care of if a problem arises. 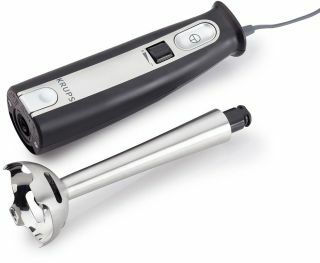 In addition to being a durable, high-performance immersion blender, the KRUPS GPA30842 is getting good reviews for some of its other features and attachments as well. One customer said that the handle is very soft and has silicone rubber grips. This person says that they have arthritis and the grip on this blender is very comfortable for them. The mini chopper attachment that comes with this blender is also very useful and one customer said that they use it more than you would imagine. It comes in very handy for chopping garlic, onions, herbs, or nuts. The whisk attachment is also very useful for beating eggs or making whipped cream. Although there are not a lot of reviews online yet for the KRUPS GPA30842 Immersion Blender, the reviews that we did find were incredibly positive, which makes it very easy for us to give this immersion blender our recommendation.